The Jihonjuku Academy of Warrior Spirit hosts the most teaching talent of any Aikido school in the Southeastern United States. 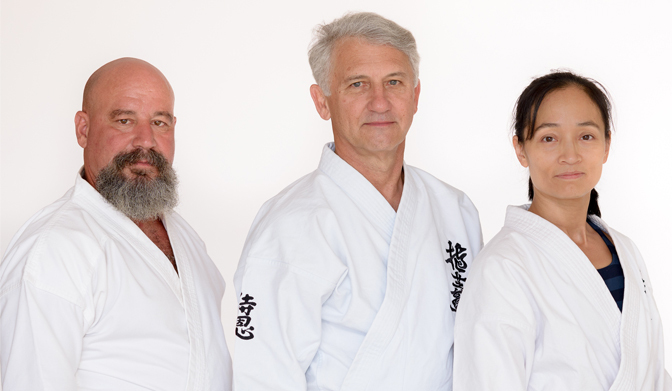 Collectively, the faculty have over 20 aikido black belt ranks, with several more in other styles. Each one of our instructors is experienced and high-ranking enough to lead a school of their own. This combination of talent gives students the opportunity to experience a full spectrum of perspectives in their training experience, instead of just one single viewpoint. Brief instructor biographies are linked below. The Aikido Dojo is affiliated with the Aikido Schools of Ueshiba (ASU) under Saotome Shihan, and with the Aikido World Headquarters. Saotome Shihan himself was a student and uchi-deshi (live-in disciple) of the Founder (Morehei Ueshiba O-Sensei) and is recognized as one of the world’s most respected masters of the art.